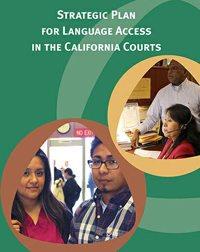 SAN FRANCISCO—The Judicial Council’s Language Access Plan Implementation Task Force will hold a public meeting on March 22 in San Francisco to listen to community members and discuss task force efforts to increase language access to the courts for limited English proficient (LEP) court users. Meeting topics will include: court progress in expanding access to interpreters in all civil cases; web and technological solutions that help increase access for LEP court users; and the important role of language access services provided outside of the courtroom (self-help centers, legal service providers, etc.). The public meeting will be held on March 22 from 10 a.m. to 1 p.m., in the Malcolm M. Lucas Board Room, Third Floor, Judicial Council Conference Center, 455 Golden Gate Avenue, San Francisco. Language assistance provided at the meeting will include: American Sign Language, Cantonese Russian, Spanish and Vietnamese. A live audiocast and videocast of the meeting, as well as closed captioning (in English and Spanish), will be available on the Language Access webpage. In addition to commenting at the meeting, members of the public can e-mail comments to LAP@jud.ca.gov. Written comments received by 10 a.m. on March 21 will be provided to task force members for the March 22 meeting.